We decided to start our first day on Hatteras Island with a visit to the lighthouse, which was only a couple miles north of our motel. We’ve become a bit fascinated with lighthouses ever since our trip to Florida in 2011, during which we saw the St. Augustine Lighthouse. According to the National Park Service, which maintains the lighthouse and the keepers’ quarters, the Cape Hatteras Lighthouse protects one of the most hazardous sections of the Atlantic Coast. Offshore of Cape Hatteras, the Gulf Stream collides with the Virginia Drift, a branch of the Labrador Current from Canada. This current forces southbound ships into a dangerous twelve-mile long sandbar called Diamond Shoals. Hundreds and possibly thousands of shipwrecks in this area have given it the reputation as the “Graveyard of the Atlantic”. This is a beautiful lighthouse, and one of the most famous and recognizable in the world. Climbing to the top is allowed. If one is up to the challenge, for a fee of $8, one may climb the “257 steps from the ground to the watchroom, which is equal climbing a 12 story building. The stairs have a handrail only on one side and a landing every 31 steps. There is no air conditioning. It may be noisy, humid, hot and dim inside the lighthouse and there is two-way traffic on the narrow stairs.” Having the dogs with us, we declined. At least, that is our story and we are sticking to it. Improvements were made, but in the end, at the behest of mariners and officers of the U.S. Navy, Congress appropriated $80,000 to construct a new beacon at Cape Hatteras in 1868. While the above information was taken from Wikipedia, we had the good fortune to hear a talk from one of the Park Rangers while we were there. He described the shifting sand and erosion with the use of visual aids such as geological graphs and actual sand. The Atlantic Ocean to the east and the Pamlico Sound to the west, the road just a tiny strip down the middle, connecting the small villages that dot the island. More to come, including a visit to the Wright Brothers National Memorial. 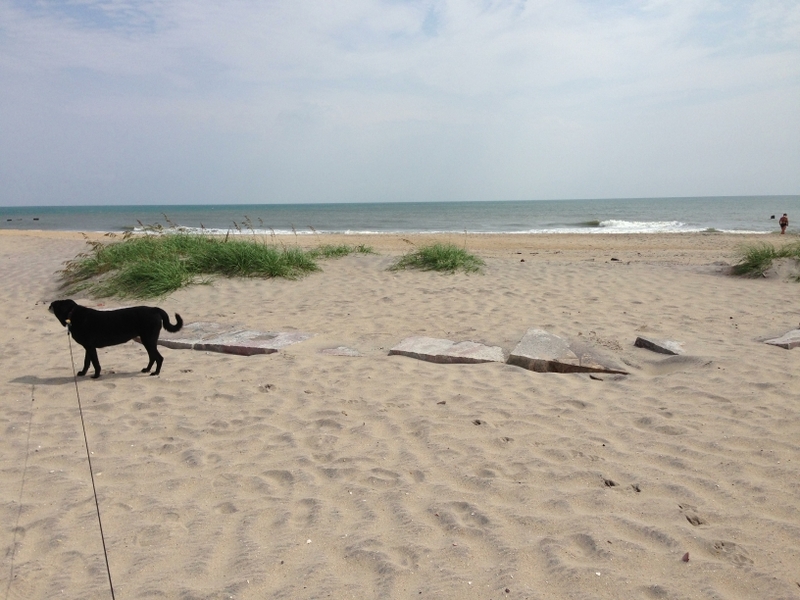 This entry was posted in Blog Update and tagged Cape Hatteras, lighthouses, outer banks, travel. Bookmark the permalink.